If so, this session is for you. Together, we will consider the benefits of affording preschool and school age children opportunities to build forts and dens, and how this reflects the four foundations highlighted in How Does Learning Happen? Ontario’s Pedagogy for the Early Years. 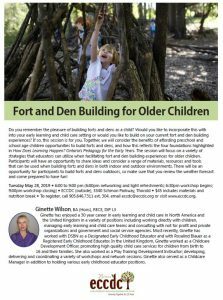 The session will focus on a variety of strategies that educators can utilize when facilitating fort and den building experiences for older children. Participants will have an opportunity to share ideas and consider a range of materials, resources and tools that can be used when building forts and dens in both indoor and outdoor environments. There will be an opportunity for participants to build forts and dens outdoors, so make sure that you review the weather forecast and come prepared to have fun!